Comic, tragic, grand, and spectacular. 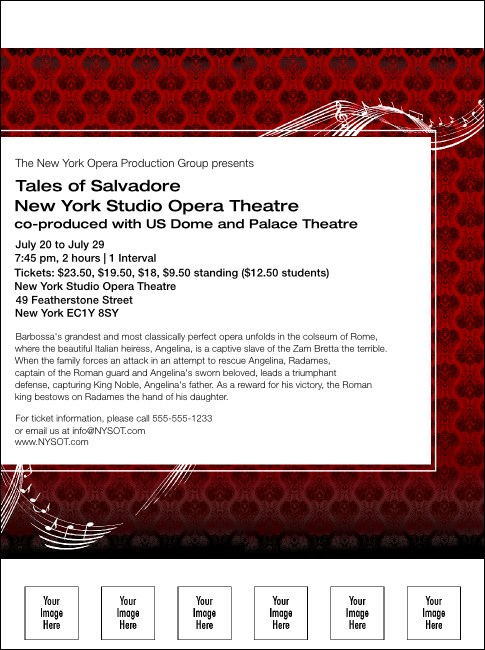 Whether it ends with a marriage or a funeral, your opera event begins with your event details on the Opera Flyer. With a lush, red, Victorian-style background and flowing musical notes, this Flyer offers you nineteen lines of text and six spots to add your own custom images. Let TicketPrinting.com be part of your Grand Work with the perfect advance publicity.